This first game is our most popular game for grades K – 8. You will find all kids that participate in this game will want to play it over and over again. Organize 2 teams. Place half your pizza boxes right side up and the other half upside down in the middle of the pizza mat. Instruct kids to stand on any one of the squares outside the pizza mat and either hop, skip, or jog around the mat. When you call PIZZA! one child from each team will rush to the middle and grab their pizza box. Call out the fraction they need to place their pizza box on. The first team to place their pizza box on the correct fraction gets to keep their pizza box on the corresponding pizza. All team members help each other to find the fraction. Fraction problems cards can also be used in combination of calling out fractions. This game can be played until there are no more pizza boxes or the time limit is up. 1. When the students arrive at your station ask them to sit down along the side of the mat so that they can hear your explanation of the activity. Find out their current grade so that you can choose from the menu below. Once seated, briefly explain the goals of the station (e.g., We are going to be having fun with pizza fractions). You may ask the students what they ‘notice’ or know about the fractions. Listen to one or two responses. We want to ensure that students have fun while learning. Always allow the students time to respond/answer but help them if they need assistance. Some students may have difficulty with a concept and we never want them to feel ‘helpless’. Other students may be paired with someone who needs extra assistance. Always use ‘math language’ as appropriate for the grade level. Specific ExpectationsQuantity Relationships– divide whole objects into parts and identify and describe, through investigation, equal-sized parts of the whole, using fractional names (e.g., halves; fourths or quarters). What do you notice about the mat? Who loves pizza? Who could eat a whole pizza? Who would you share with? How many are in your family? Which pizza would you like for your family? Stand on ½, ¼ etc. Who can find a fraction that they can read? Stand on a fraction that you can read. The students should sit around the pizza mat. Leader: “I spy with my little eye a pizza that has two equal parts”. Students, if you see a pizza that has two equal parts put a pizza box on it. Choose one or two students to look under the pizza boxes to check if they have two equal parts. Students walk along the border of the pizza mat. The leader says “Pizza” and the students freeze and face the section of the pizza mat closest to them. The leader says halves (or quarters, thirds etc.) and the students use the pizza boxes to cover the pizzas in their section that match the fraction. An “official checker” student looks at each section to see if any were missed and then they look at the pizza boxes and the team gets one point for each correct pizza. Look at the pizzas. Ask “ Can you find pizzas that are almost all eaten? Which pizza would you want? Explain why. Which pizzas could go together to make a whole pizza? Show the students one-fourth of a pizza. Ask “Who can find a bigger slice(s)? What is it called e.g., ⅓ or ½? You can reinforce it by saying “Yes. ⅓ is larger than ¼ while pointing to the pizzas. Ask the students how ⅓ is larger than ¼.
I Am Standing . . . Choose a student to find a pizza to stand on and tell the group what it is called e.g., “I am standing on a pizza that shows 1/2.” . Who can find other pizzas that show 1/2.? Students stand on matching pizzas. Note a student may stand on 2/4 because it is the same as 1/2. Bingo chips or objects to identify pizzas. Divide students into four teams. Each team sits at one of the coloured sections. Begin with the purple team and rotate clockwise. The purple team turns over a card and places a marker on a matching pizza space. Repeat for the next team. The teams continue taking turns until one team has three in a row. Goal: Be the first team to spell PIZZA. Divide students into 4 teams, one for each section on the mat. One student from each team stands on one pizza in their section. If the spinner says ‘largest’, the students decide who is standing on the largest amount of pizza. That team gets the first letter in the word pizza.It is possible for there to be a tie and both teams get a letter. Repeat. Students take turns standing on a pizza until the word PIZZA is spelled. Students should sit around the mat so that they can see the fractions. Ask one student to point to a fraction name it e.g., two-fourths. Ask the other teams to find the fraction two fourths in their section. The teams continue taking turns until they have three in a row. If the spinner says ‘largest’, the students decide who is standing on the largest amount of pizza. That team gets the first letter in pizza.It is possible for there to be a tie and both teams get a letter. Repeat. Students take turns standing on pizzas until the word PIZZA is spelled. Goal: to toss the snowball onto the largest or smallest fraction in their section of the mat. The winning team of each round earns 1/5 of a pizza. The first team to have 5/5 of a pizza wins! Form 4 equal teams and each team stands at a section of pizza on the mat. Students stand on the outside of the mat. One student from each team tries to land their snowball onto the largest or smallest piece of pizza in their section. The team (teams) that land their snowball on the required piece earn 1/5 of a pizza. Teams rotate clockwise to stand in front of a different section. The first team to have 5/5s of a pizza wins! Extension (Optional): Put a blank piece of paper on some pizzas to eliminate them and make it more challenging. Goal: to sell $100.00 of pizza. Each pizza is worth $25.00. Form two teams. Each team has half of the mat. Roll the dice to create a fraction. The red number is the numerator and the black number is the denominator. Each team looks for the fraction that matches the fraction rolled. If they have a matching pizza they earn $25.00. Repeat until one team has sold 4 pizzas. Goal: to find a fraction of pizza that is more or less than the selected pizza. If a team can not make a move, they earn a letter. The game is over when “OH No!” is spelled. Divide the students into two teams: A and B. Each team has half of the mat. Team A chooses a pizza and names it e.g., 4/8. Tails = find a smaller fraction pizza. Fraction Cards: Cards with fractions written on them to match the mat. Team A begins. Turn over a fraction card. The team looks for the fraction anywhere on the mat. Once it is located, start the timer. Allow 2-3 min for the team to find at least one equivalent fraction. The team gets 10 points for each match. Team B has to find a larger/ smaller pizza. If they are successful they name their pizza and the coin is tossed again. Continue until a team can not find a pizza that is larger/ smaller pizza as required. If a team can not find a pizza then they earn a letter. Once a team spells “Oh no!” the game is over and ….? No, and? Fraction Cards: Cards with fractions written on them to match the mat. See the list below. Divide students into 4 teams. Choose a student to spin the spinner. Teams choose one pizza to cover with the box. Repeat until a team has 3 in a row. 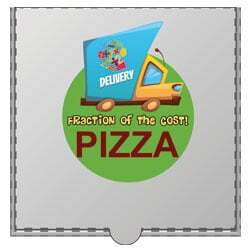 We ship for free our Pizza Fraction mat to all North American schools and organizations. 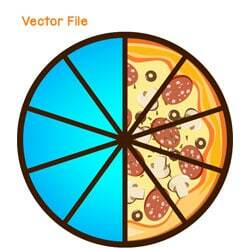 Pizza Fraction game printables. The pizza boxes and pizzas can be printed, laminated and for more durability glued on black foam from the dollar store or Michaels’s with teacher discount. You can create any number of fractions including more equivalent fractions to place on your game mat.